Indulge your four legged family member with a warm beverage treat. 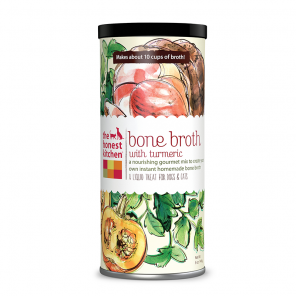 The Honest Kitchen Bone Broth with Turmeric is perfect for chilly days and post-hike hydration. Made from a mix of human grade, dehydrated ingredients like nourishing parsley, pumpkin and turmeric extract, this broth mix is designed to be blended with hot water before serving to provide your pet with a delicious and satisfying treat. Bone Broth with Turmeric helps your pup or kitty feel warm, loved, hydrated and happy in the tummy.